Now that you’ve got a Programmable Wireless SIM with a Rate Plan configured, you will want to make sure the SIM is Active on the cellular network. 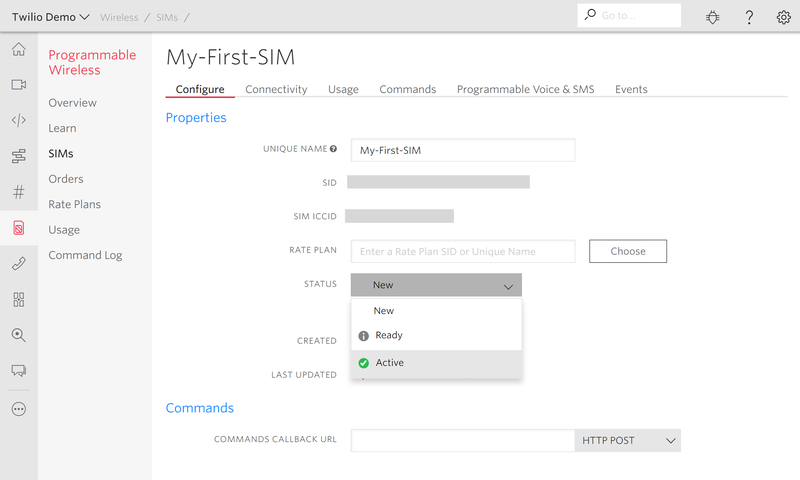 The available status values of a Sim instance are described in the SIMs REST API. You can view those status values here. In your Console, the status of your purchased SIMs are indicated in the Status column on the SIMs page, as well as on the Configure tab of a selected SIM. Open the SIMs section of the Console. Select any SIM, which will display Configure tab for that SIM. The current status will be shown in the STATUS dropdown menu. You can open the dropdown menu and change the status. Options include New (default), Ready and Active. I want to validate that my SIM can connect to the network without initiating a Monthly SIM Fee*. Place your SIM in the ready state. You can send up to 250KB of data before it transitions to active. There is no Monthly Recurring Cost on a SIM in this state up to three months. I want to quickly test a large number of SIMs without incurring a large MRC charge. See above. Your SIM can live in the ready state for up to three months without charge. Can a SIM use Programmable Voice, Programmable SMS or Commands in the ready state? No, currently a SIM must be in the active state to use Programmable Voice and Programmable SMS. This support is coming soon. I’ve got an active SIM but what can I do with it? Your SIM is live and ready to use with the capabilities you’ve enabled. Continue to the next sections to learn about machine-to-machine commands, make phone calls with Programmable Voice, or send text messages with Programmable SMS.